At Envii we care about how good you look in our clothes, for as long as you have them! We thought we could share some advice with you, on how you can take care of your new garments, in a way that will extend the life of the clothes and make it last long. Just as important, these tips will help reduce your impact on the environment and take better care of our planet! The washing instructions on the care label are a good starting point for how to care for your garment, but we wanted to share some additional advice beyond the tag. No need to wash your clothes every time you wear them, unless they’re noticeably dirty. By hanging a sweater or a pair of pants outside, or in your bathroom, where it is a bit humid, it should be enough to regain that fresh feeling. You will save energy when you wash your clothes in cooler temperatures, by using the eco settings on the machine, and/or choosing shorter cycles. It is often enough to wash your clothes on 30°, if they are not very dirty. When you wash at lower temperatures, it is best to use a liquid detergent instead of powder, since it dissolves better. Use the dose of laundry detergents recommended on the box or bottle, since using more than this will not make your clothes cleaner and will only have a negative environmental impact. Try to avoid using fabric softeners, unless you are washing garments that are 100% synthetic, such as polyester, as this removes the static electricity in the garment. Also avoid dry cleaning unless the label states, “dry clean only”. Dry cleaning and fabric softeners have a greater negative impact on the environment, so only use them when they are necessary. When washing fine and thin materials such as silk, jerseys, viscose and wool, use a laundry bag to protect these delicate clothes. Tumble dryers use a lot of energy. It is better for your clothes and for the environment to hang your clothes to dry. Pilling is a common occurrence in natural materials such as wool. Use a sweater stone or clothing brush gently across your clothes to remove pilling and refresh the look. When you no longer use or like your clothes, swap them or donate them. Zero environmental impact! Value your clothes, consider repairing before replacing. Repairing is one way to extend the life of your clothes but you might also consider a fun redesign instead. Cotton is the most used material for fabric, since it is very strong and budget-friendly. Cotton is a natural fiber that in its raw state is not naturally strong. To make it into a strong yarn, it needs to be twisted or spun. It can then, be woven into cotton cloth or knitted into cotton jersey. Cotton fabric is popular because it is easy to care for and comfortable year-round since cotton “breathes". Cotton is easy to clean; it can be machine-washed. Polyester is a fine synthetic fiber that is thin and smooth, but at the same time very strong. Polyester is one of the most used materials for fabrics, and one of the most long lasting fabrics for clothes. It maintains the color well after wearing and washes, and it does not wrinkle as much as other fabrics. Clothes made of polyester can be machine-washed and do not shrink. Wool is the textile fiber made from sheep and other animals - including cashmere and mohair from goats. After use, wash is often unnecessary, especially if it has not been in contact with skin. Instead place the garment on a hanger and hang it somewhere in the bathroom, where the air is humid, or let it air outside. This often does the trick instead of having to wash it. When you do have to wash wool, always use a special liquid detergent for wool. Wash in the machine on a wool program or by hand, and make sure to follow, the care label instructions. Chunky-knits should be shaped and dried lying flat in order to regain their original shape. In general, in order to take care of your knits and maintain their shape, try to avoid hanging them in the closet. Instead, fold them to store. Most wool jackets need to be dry-cleaned. Viscose is a natural material and can shrink slightly when washed. Wash at low temperatures. Steam iron the garment to restore it back to its original shape. Jersey is a knitted fabric, which can be made out of cotton, wool and synthetic fibers. Single knitted jersey is very stretchy and lightweight, and has one flat side and one piled side. Double knitted jersey has less stretch and is made of two single jerseys knitted together to a heavier fabric with two flat sides on each side of the fabric, and the piles in the middle. Jersey can be machine-washed. Acrylic is made from synthetic fibers. Garments made from acrylic are easy to clean because they can either be machine-washed or dry-cleaned. Acrylic is lightweight, soft, and warm, with a wool-like feel. Some acrylic fabrics may pill easily, though there are low-pilling variants. The fiber requires heat to "relax" so garments made of acrylic can be a bit stiff while wet, so it is not as warm when wet as wool would be. Wash jeans inside-out to reduce color-fading. Hang up the jeans as soon as the wash program ends to avoid creasing in the fabric. Clothing of leather and suede should be dry-cleaned. Follow the washing instructions. Only use a professional dry cleaner specialized in leather. Apply protection spray on leather and suede before use, and then every six months. Never use water to clean a suede garment. Instead, you should try to do so with a dry cotton cloth. Due to its textured nature and open pores, suede may become dirty and absorb liquids quickly, so try to avoid using it when it rains. Silk is a natural protein fiber that can be woven into textiles. Silk is a very delicate material that needs to be treated with caution. Use a special laundry detergent when you wash silk and do not stretch the product when wet. Care instructions for most silk items are either to hand wash or use a very gentle machine wash cycle. Sometimes dry cleaning is recommended, due to the construction of the garment. 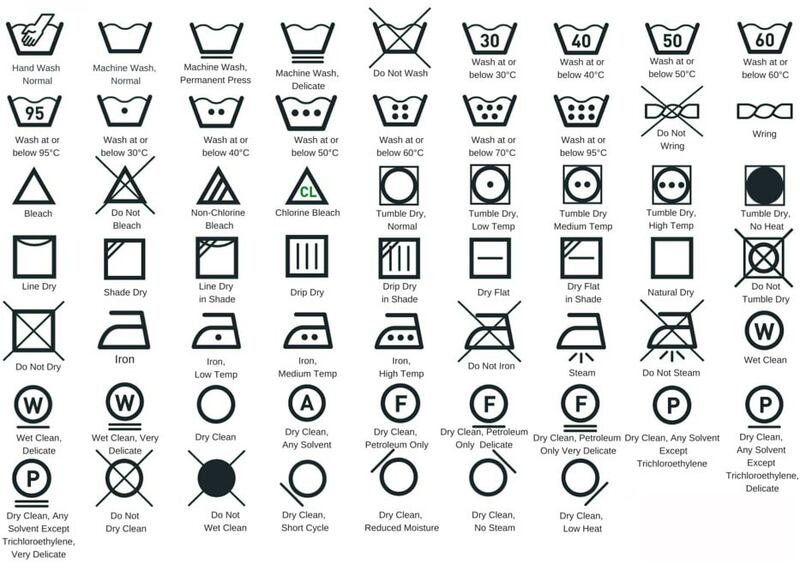 Always follow the washing instructions on the label inside the garment. Cashmere wool is a natrural fiber made from cashmere and other types of goats. Cashmere has a fine texture and is strong, light and soft to the skin. Pilling is normal on cashmere and is caused by the cashmere fibers, rubbing together during wear. Air garment after use. When necessary, always follow the washing instructions on the label inside the garment before washing. The puffer jacket is filled with synthetic insulation that doesn’t take heat well, so wash on low temperature and don’t use the dryer but lay flat to dry. With a synthetic filled jacket you will retain 90% of insulating capabillity even though the garments is wet. We recommend rinsing your swimwear immediately after use. Cold gentle machine wash garments separately, or hand wash, and use a mild detergent.